Abby Ginzberg has made a terrific new film, “Soft Vengeance: Albie Sachs and the New South Africa.” It brings to life one of the great human rights heroes of our time, a Jewish South African who joined the African National Congress, became one of the principal crafters of the South African constitution, and then a member of democratic South Africa’s constitutional court. Sachs spent two long stints in solitary confinement in apartheid-era prisons, and he later lost his right arm and the sight in one eye as the result of a bomb blast in Mozambique in 1988, but his commitment to justice and his zest for life emerged intact from those searing experiences. For Albie Sachs, the “soft vengeance” for the bomb blast was the triumph of justice and democracy in South Africa. Ginzberg’s film works splendidly on three levels. It is first a story of an special, vital individual whose open personality, sense of humor, and burning passion are contagious. Secondly, it’s a national story, reminding its viewers of the tremendous odds that South Africans working for democracy faced, and of the great triumph of their collective struggle. Finally, “Soft Vengeance” is a story about what Sachs called in our discussion the “emancipatory” potential of the law. Sachs had grown up thinking of the law as an instrument to protect property and the interests of the powerful. As a lawyer in an activist movement, he came to understand how law can be used creatively in the service of freedom. Not only did he go on to play a part in the new constitution for South Africa, but as a member of the Constitutional Court he penned some ringing human rights judgments, including the decision that legalized gay marriage, the first African nation to do so. Abby Ginzberg was also trained as a lawyer before she started directing films 30 years ago, so she brings a special passion for the subject of “emancipatory” justice to each of her projects. 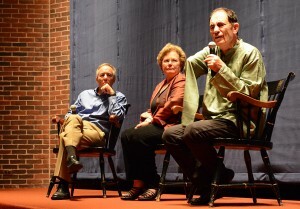 We were fortunate to have Albie Sachs and Abby Ginzberg with us at Brandeis University last week for a special advance screening of “Soft Vengeance,” the first on a college campus. 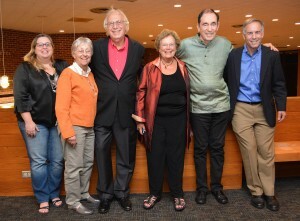 We at the International Center for Ethics, Justice and Public Life were pleased to be joined by the National Center for Jewish Film and the Louis D. Brandeis Legacy Fund for Social Justice in presenting the event. The screening took place on September 11, and perhaps there was something appropriate in this. Albie Sachs has had a special ability to transform personal suffering into a force for social good. He spoke eloquently about how, in the aftermath of the bombing, he had an ebullient feeling: “They came for me . . but I am still here!” Human rights activists around the world are his comrades, Sachs told the audience, but they can be so dour. Why not, he suggested, seek both joy and the struggle? Hearing from Albie Sachs on September 11 was an opportunity for all Americans in the audience to think about the extent that we have or have not used the events of 13 years ago as a motivation for positive, productive change. As the fall semester begins, I’m excited about a new program for undergraduate students that’s going to bring new energy to a developing global field. For more than 15 year my colleague Cindy Cohen has been building an extraordinary program in “Peacebuilding and the Arts” within the International Center for Ethics, Justice, and Public Life at Brandeis. Along the way, she has been extending the reach in this expanding field through her courses for undergraduate and graduate students. This fall, her program takes another step forward, as we introduce a new minor for Brandeis undergraduates: “Creativity, the Arts, and Social Transformation.” Partly in tribute to the program’s strengths in theater and peacebuilding, the minor will go by the acronym CAST. Students in this minor will take an introductory course, Introduction to Creativity, the Arts, and Social Transformation, that Cindy will develop and teach in the early years of the program. They will then be able to choose four electives from a strong array of courses in the arts, the humanities, and the social sciences. A capstone will complete their CAST experience; this might consist of an internship, a directed study, or another form of immersion in the CAST approach. Students in CAST will have access to the extraordinary network of artists and peacebuilders from around the world that Cindy has built, particularly through the extraordinary Acting Together project and her terrific collaboration with singer/activist Jane Sapp, A Way Out of No Way. They will also have a chance to think about how they can combine their own creative impulses and practice with the knowledge and the skills necessary to work with communities to create meaningful social change. I’ll be looking forward how Cindy and her students shake things up in the months and years to come.